With its beautiful beaches, fun resorts, and ocean activities, Cabo San Lucas is a top destination for vacationers. Located on the southern peninsula of Baja California, the waters of Cabo San Lucas is a union between the Pacific Ocean and the Sea of Cortez. 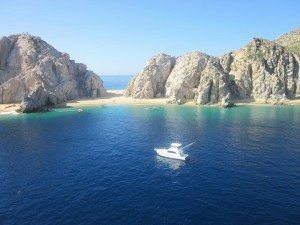 This environment is unique on its own, but visitors agree with their Cabo San Lucas fishing reviews that Cabo San Lucas Fishing offers a truly one of a kind experience. Along with year round sunshine, Cabo San Lucas also offers year round fishing. Fish in the area include marlin, swordfish, wahoo, snapper, yellowtail, dorado, cabrilla, corvina, and roosterfish. You might even catch a glimpse of a hammerhead shark and whales depending on the time of year! If you would rather be one with the fish and swim with them, Cabo offers some great snorkeling as well. Cabo San Lucas Fishing takes you to the best snorkeling spots at Santa Maria Bay and Chileno Bay. Santa Maria Bay’s calm and clear waters allows you to take in all of the marine life and tropical fish of the area. Chileno Bay is also a great spot and is home to sea turtles, manta rays, and a ton of tropical fish. Along with fishing and snorkeling, Cabo San Lucas is a great place to vacation for its sheer beauty. The postcard shot of Cabo is the arch at Land’s End, or El Arco, and it truly is a mark of beauty in the area. Rock formations like El Arco are unique to the peninsula of Baja California because of the rough winds and seas of the area. Even the human-made landmarks of Cabo San Lucas are beautiful such as Iglesia de San Lucas, built in 1730, and the plaza that surrounds it. Popular vacation destinations are often swarmed with tourists that can make it difficult to appreciate the place you are in. Cabo San Lucas, however busy, somehow still provides the opportunity to have a private and comfortable vacation experience. One of the best ways to get this is by leaving shore and hopping on a boat out to sea. There are plenty of opportunities to have private parties or an intimate sunset cruise in Cabo. Cabo San Lucas Fishing offers some of the top rated charters, so make sure to check out these options on our website. With miles of beaches around the area, you are also able to escape the hustle and bustle of town at one of Cabo’s secluded beaches. Make sure to ask one of the crewmembers at Cabo San Lucas Fishing for their recommendations of quieter beaches in the area. Cabo San Lucas Fishing is a top rated fishing charter in Cabo San Lucas. Our mission is simple: to provide the best sport fishing adventure possible for fishing Cabo San Lucas. We provide all of the fishing equipment you need to have a fun and unique fishing experience. Cabo San Lucas Fishing was named the number one fishing charter in Cabo San Lucas by Trip Advisor. We offer a variety of services depending on what your interests are. There are multiple options for Deep Sea Fishing, depending on type of boat and services you are looking for. Prices start at $600 for a 5-hour tour on our Blue Marlin boat, which includes breakfast, beer, soda, water, and fish cleaning. We also have a variety of Sunset Cruise options for you depending on how many people are in your party. All sunset cruises are 2 hours, start at $400 for 6 people, and include pizza, an open bar, and complimentary photography. We also do trips to Santa Maria and Chileno Bay for snorkeling. Check out our website to get a quote for booking a snorkel tour! Private yacht rentals are a great way to spend time with your family and friends while seeing the sights of Cabo San Lucas. Private yachts and party boat rentals start at $350 for 3 hours and 6 people. Make sure to check out the Cabo Condo Rental on our website that includes two bedrooms and a free Cavalier Convertible and sunset cruise! This condo is located in downtown Cabo San Lucas and sleeps up to 6 people for $150-$300 per night. If you have a bigger party traveling with you to Cabo, make sure to check out our special at our Cabo Vacation Rental. We offer three and four bedroom homes located 10-15 minutes outside of town. These homes sleep up to 10 people, and we are offering $1450-$1800 for a 7 day rental. This rental also includes an 8 passenger Ford Excursion SUV, propane BBQ, patio cabanas, and a community pool. With all of the fun activities and services that Cabo San Lucas Fishing, we are proud to be the top rated fishing charter in Cabo San Lucas.